As shown in this post, it is possible to read out the approximate level of VCC by comparing the internal 1.1 V bandgap with the current VCC level. First thing to note is that the ADC is now run in noise-canceling-reducing mode, i.e. 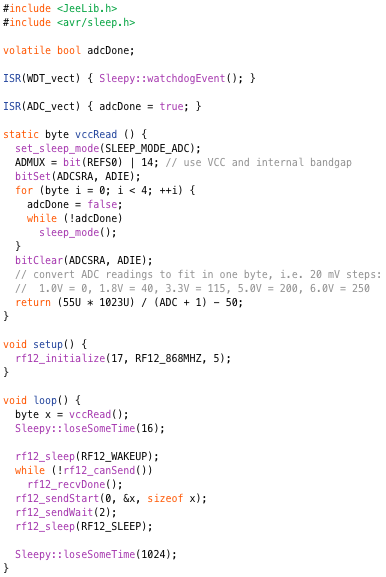 a special sleep mode which turns off part of the chip to let the ADC work more accurately. With as nice side-effect that it also saves power. The other change was to drop the 250 µs busy waiting, and use 4 ADC measurements to get a stable result. The main delay was replaced by a call to loseSomeTime() of course – the JeeLib way of powering down. Lastly, I changed the sketch to send out the measurement results over wireless, to get rid of the serial port activity which would skew the power consumption measurements. As usual, the red line is the integral of the current, i.e. the cumulative energy consumption (about 2300 nC). 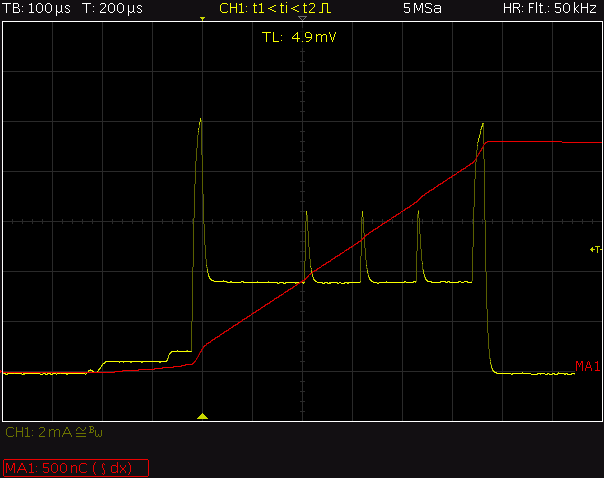 And as you can see, it takes about 550 µs @ 3.5 mA current draw to perform this battery level measurement. The first ADC measurement takes a bit longer (25 cycles i.s.o. 13), just like the ATmega datasheet says. The total of 2300 nC corresponds to a mere 2.3 µA average current draw when performed once a second, so it looks like calling vccRead() could easily be done once a minute without draining the power source very much. The final result is pretty accurate: 201 for 5V and 147 for a 4V battery. I’ve tried a few units, and they all are within a few counts of the expected value – the 4-fold ADC readout w/ noise reduction appears to be effective! Update – The latest version of the bandgap sketch adds support for an adjustable number of ADC readouts. It’s not “noise cancelling” as such, it’s just a noise reduction mode where almost everything but the ADC is turned off. This reduces the amount of electrical noise in the first place – not quite the same as cancelling it. Great work, thanks for also analyzing the power usage. I am going to use this in my solar and battery experiments. Do you know if it is possible to do the same trick with setting another pin as the Ref to measure for example the solar panel voltage and the Vcc (battery) voltage? You can either use the voltage on the AREF pin, or AVCC or the internal bandgap as the reference, but once you know what the reference IS, you can work back in software to correct all the other inputs. Unfortunately, the internal bandgap is only accurate to ~10% which won’t be good enough for many, better voltage references are available.